Our cappers and corkers are available in various configurations to suit your individual needs. All have hardened and rectified steel jaws and bronze trolleys, obtained by numerical control machines and matching centers that guarantee perfect interchangeability. All of our automatic corkers, cappers and wire hooders are electromechanical for longer life. 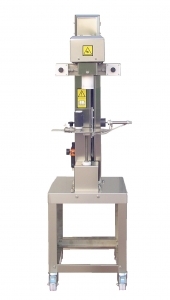 Pneumatic, semi-automatic capping machine for applying ROPP style capsules onto threaded neck bottles. Pneumatic, semi-automatic capping machine for applyhing twistoff-style caps.